H. Upmann Ashtray Free With Box Purchase! 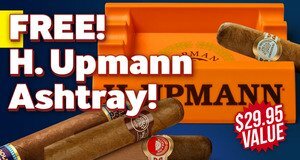 Buy a box of H. Upmann Golden Nicaragua, H. Upmann Connoisseur, H. Upmann Original, H. Upmann Special Seleccion cigars, get an H. Upmann ashtray, valued at $29.95, absolutely FREE! Free H. Upmann ashtray with purchase!